Dr. Davy Cheng is the Distinguished University Professor & Chair / Chief in the Department of Anesthesia & Perioperative Medicine; and the Division of Critical Care Medicine at Western University, London, Canada. He is the Research Chair of the Evidence-Based Perioperative Clinical Outcomes Research (EPiCOR) and is the Medical Director of the MEDICI Centre (Medical Evidence, Decision Integrity, Clinical Impact). Dr. Cheng has served as Chair of the Ontario Blood Advisory Committee (OBAC) at the Ministry of Health & Long Term Care (MOHLTC) from 2012-2016. 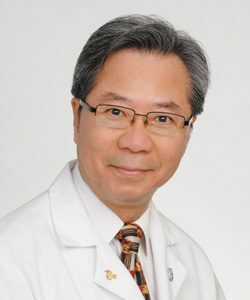 Dr. Cheng was awarded Canadian Anesthesiologists Society Gold Medal Award (2015); elected Honorary member to The German Society of Anaesthesiology and Intensive Care Medicine (DGAI)(2014); recognized with the Canadian Society of Physician Executives (CSPE) Excellence in Medical Leadership Award (2014); and was inducted as Fellow to The Canadian Academy of Health Sciences (2007).